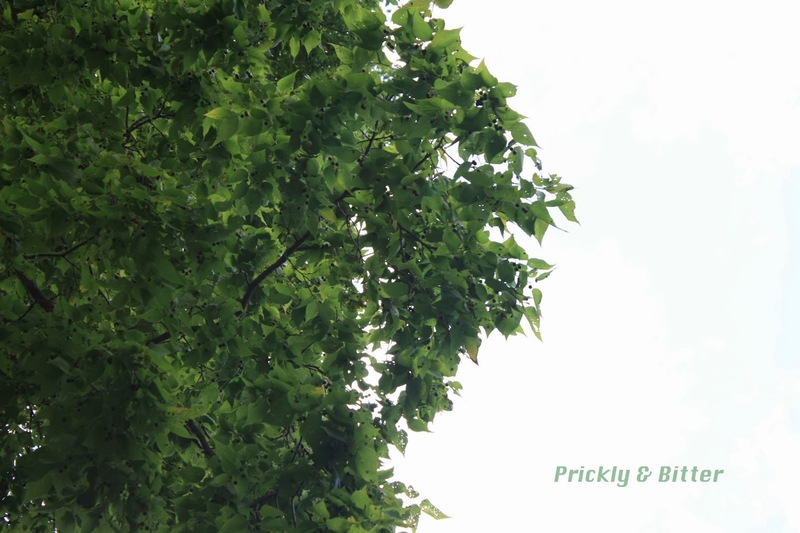 To keep with our "super-massive-gigantosaur" trees on campus, I have a compilation of pictures of the two biggest hackberries. Actually, I might be wrong on that one. When I asked Jane back in June if these were the biggest hackberries, her response was "I think so." Because it wasn't an adamant "yes!," I can't be positive; I'll have to keep track of all of the really big hackberries on my wanderings around campus from now on to see if I can find a bigger one than this one. Hackberries are trees that are native to the Carolinian forest, with their native range extending from Ontario and Quebec in Canada south to Tennessee in the United States. It still exists in moderate numbers, but has a low tolerance to disturbance so is often one of the first species lost from a forest after a clearcut (even though there are seeds that are still in the seed bank). That being said, they are very good urban trees, and can withstand quite a bit of air pollution with no ill effects. 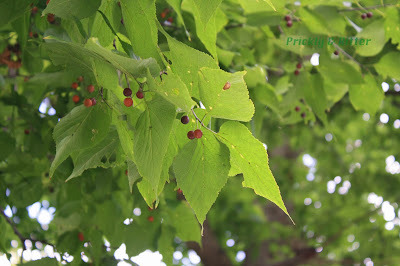 The berries on the tree, which you can see in the third, fourth, fifth and sixth images above, are a great food source for native bird species preparing to migrate south in the fall, as they are some of the most nutritious berries available. They start off green on the tree then mature to a reddish-orange. At this point they can be picked by humans for consumption but be warned: "tart" is an understatement. I tried a bright red berry and thought my mouth was about to turn inside out from the sourness of the fruit! 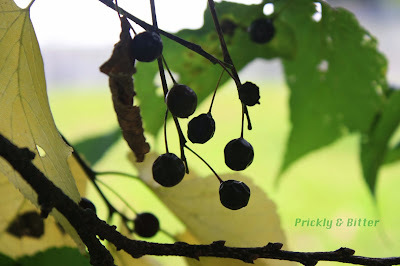 The way that hackberries are traditionally consumed by humans is as a jam or preserve-like substance: the berries are cooked in a simple syrup (equal parts sugar and water) until they are mushy. They can then be used exactly like cranberry sauce on meat! After turning red/orange on the tree they start to turn a dark purple-black, and this is what birds consume. This concentrates many of the sugars in the fruit to make it more energizing, but also concentrates other compounds that react not very nicely with the human digestive system. If eaten raw they can cause severe stomach upset (but nothing that would require a hospital visit unless a whole bucket were to be consumed!). Once they're black and wrinkly like the bottom picture they can be used in wines and beers as a fermentation product. They give the beverage a really fruity undertone that, from what I understand, is unusual and pleasant all at the same time. The good thing about hackberry trees is that the fruit that falls from the tree doesn't start to smell after sitting on your lawn after a while (the same cannot be said for apples, crabapples, cherries, Cornelian cherries, or plums! ), and the spent fruit do not attract bees or wasps in large abundance. 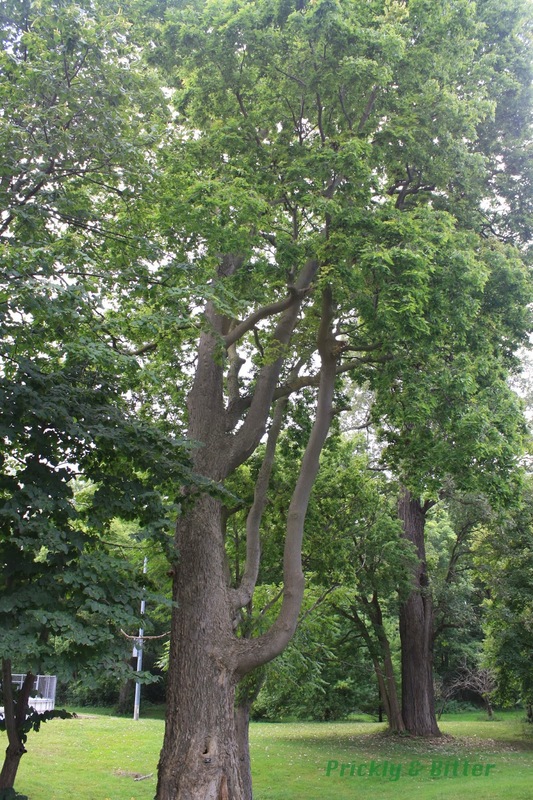 These trees do grow relatively quickly, so are a great possibility for a boulevard tree. 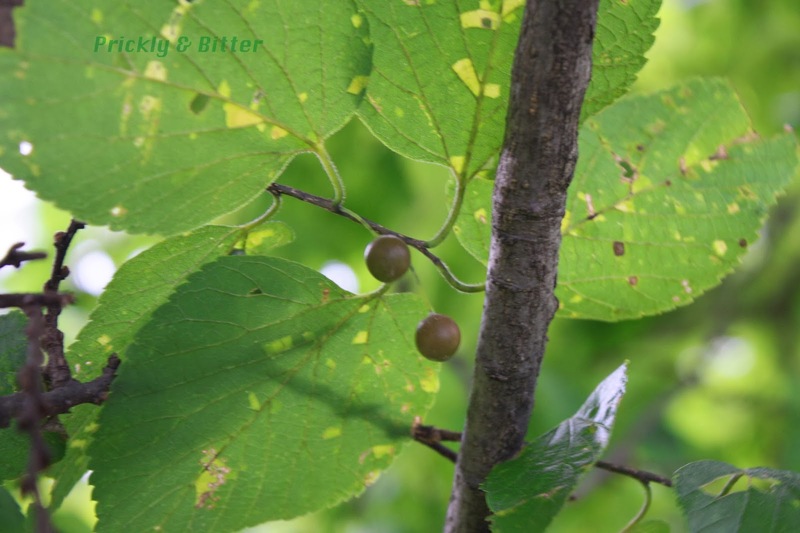 The bark is also spectacular, and one of the characteristics of hackberries that can be used for proper identification even in the dead of winter. 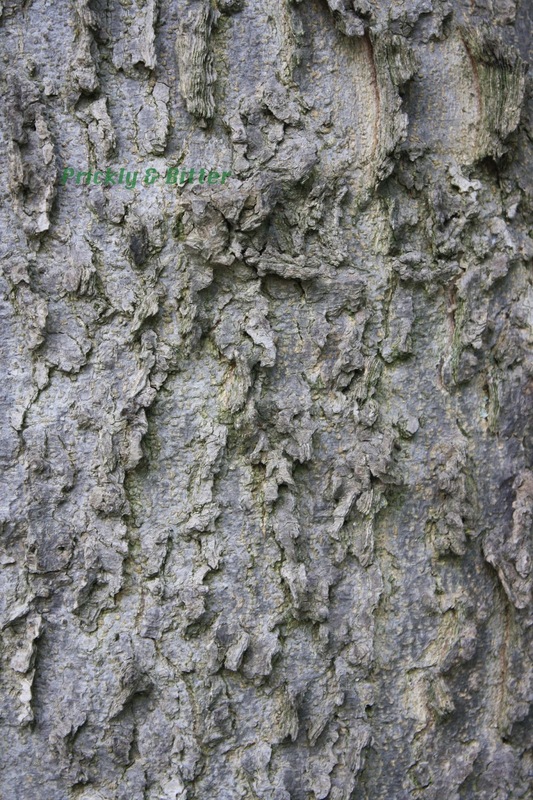 In very mature specimens where the bark is starting to peel off, you can soak the bark in water to plump it back up and carve cork-like plugs out of it to use as stoppers. A multi-function tree! If we use our same method of size estimation as last time, that tag is approximately 6 x 14 cm (or 2.5 x 5.5 inches). Using my "tag estimation method" (there are about 12 tags that could fit across the tree, so the diameter would be approximately 66 inches or 167.5 cm), the circumference of that tree is 207 inches (5.26 meters)! That's one big tree. 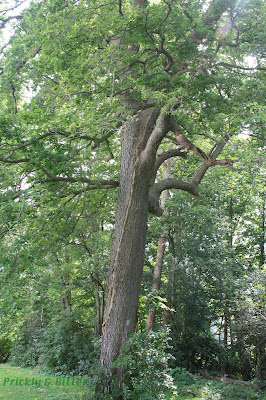 But wait...didn't I say it wasn't as large as the Burr oak? Circumference-wise, it's definitely larger at the largest point. But what you'll see if you look closely at the shape of the tree, versus the shape of the big Burr oak, this tree tapers starting nearly at the bottom of the tree. 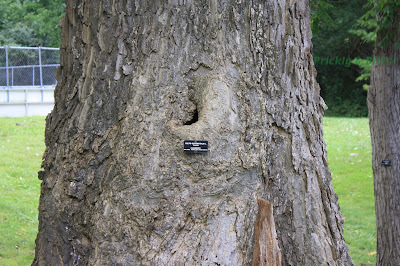 The Burr oak is like a barrel, and only starts to narrow very near the top of the canopy. 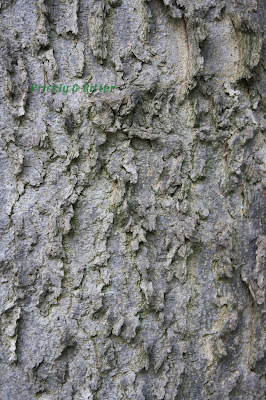 If you compare weight or total volume of the trunk of the tree, the Burr oak is much, MUCH larger. That being said, this hackberry still has quite a few years left to live (this one is probably "only" about 200 years old) so I'll have to come back to visit this tree every decade or so to see how long it lives and how much bigger it gets! 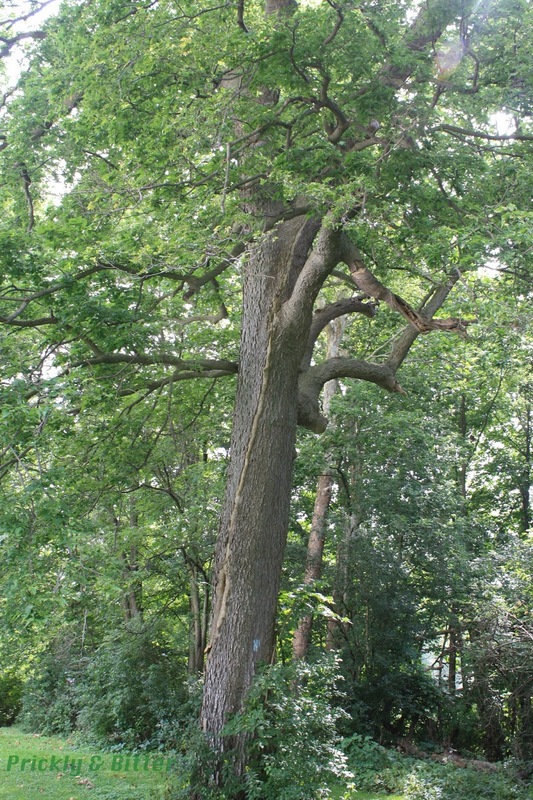 That tree might not look like much (for size perspective, it's only about half the size of the tree pictured above), but it's a survivor of a really unusual phenomenon, and one that trees rarely recover from like it never happened: lightning strikes. If you click on the image to enlarge it, you'll see a big ridge running from a large wound about 5-10 feet off the ground that extends all the way up to the end of one of the tallest branches. The lightning likely struck the branch, and the electrical charge traveled down the tree until it found a way out; that might have been where a branch once was, or perhaps it was even just a crack in the bark from a burrowing beetle or woodpecker. The ridge, while nearly impossible to tell from the angle of the picture, extends all the way to the ground on the other side of this big hole in the tree. The fact that this tree was nearly split in half by a lightning strike and has since recovered like nothing ever happened is pretty telling to how resilient this species actually is. An absolutely remarkable feat. Makes me want a hackberry just to have it get struck by lightning. What a great story to be able to tell your grandkids, or even great-grandkids!